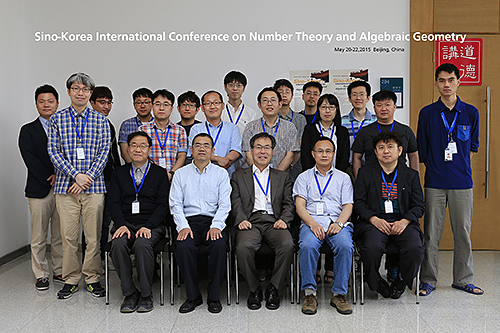 Sino-Korea International Conference on Number Theory and Algebraic Geometry was held at AMSS on May,20-22,2015. The conference invited sixteen scholars from Korea and AMSS to give lectures regarding to the development of number theory, algebraic geometry and related topics. The scholars from Korea were Kiryong Chung, Seung-Jo Jung,Kwang-Seob Kim, Sijong Kwak,Jun Ho Lee, Kyungyong Lee,Jinhyung Park, Yoon Kyung Park. The scholars from AMSS were Prof. FU Baohua, Prof.LI Wenwei, Prof. SUN Binyong, Prof.TIAN Yichao, Prof. TIAN Ye, Associate Prof.WEI Dasheng, Prof. ZHENG Weizhe, Prof.WANG Song. The conference strengthened exchange between scholars and students from two sides and further promoted bilateral cooperation in the field of basic sciences, especially in mathematics. the Memorandum of Understanding between AMSS-CAS and Korea Institute of Advanced Study (KIAS) was signed on 2014. The aim of the MOU is to strengthen mutual understanding, to foster cooperation, and to promote scientific collaboration in the field of basic sciences between the parties. Cooperative activities include exchange of scientists, information, and publications, and the organization of joint workshops, seminars, and conferences.